In order to understand how the body gains and loses weight, you must understand how it uses energy. 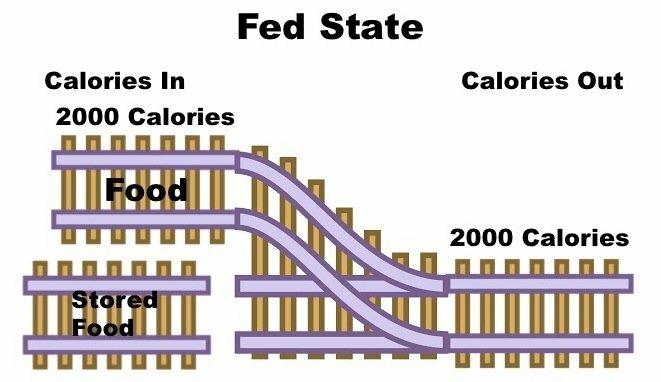 The body really only exists in one of two states – the fed and the fasted state. When we eat, the hormone insulin goes up and insulin is released. Now all foods stimulate different amounts of insulin release but few foods except for pure fat cause no insulin release at all. Insulin is really a type of nutrient sensor. It senses the ingestion of both carbohydrate and protein containing foods. Refined foods, particularly carbohydrates cause the highest release of insulin. Our bodies need a continual source of energy for basic metabolic housekeeping – keeping the heart pumping blood, the liver and kidney detoxifying, the lungs sucking air, brain function etc. Obviously we need a source of energy for all that work and it must be continuously available. Since we do not eat food all the time, we have a system of storing food energy (in the liver and as body fat) for times where we are not eating. The main mistake people make is believing that weight loss is a simple one compartment problem. That is, people think that all calories go into a single compartment and taken out of that same one. Consider the energy balance equation: Fat = (Calories In) – (Calories Out). This is always true. Suppose that your weight is stable and you eat 2000 calories and burn 2000. What if you want to lose weight? You hope that you reduce dietary calories to 1500, and body fat will provide the other 500. Over time you lose body fat. That’s exactly what does not happen. But here’s the CRITICAL point. You can only get energy from one or the other, but not both at the same time. Imagine a railroad track. 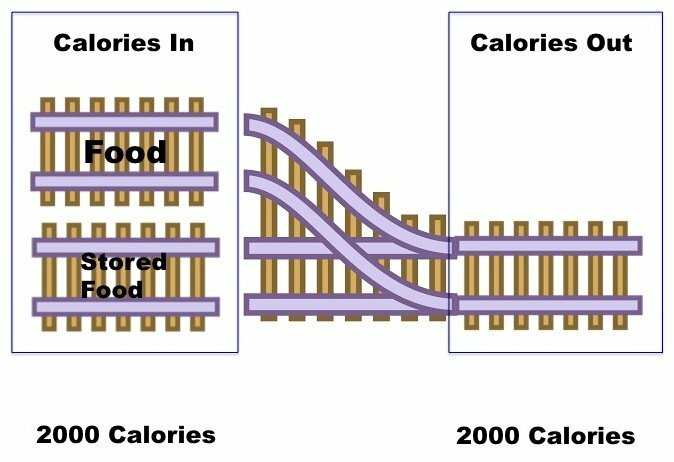 Suppose you need 2000 calories to keep basic metabolic function normal. There are two different tracks where energy can come from – either food or stored food. You may only obtain energy from one source at a time. If you take energy from the first track, you cannot get any from the second and vice versa. In the fed state, when you are eating, insulin levels are high. During that time, it makes sense to derive your energy from the food that you are eating. So what happens is that we shut down burning of stored food energy in the form of fat and glycogen. For all you technically inclined people, we say that insulin inhibits lipolysis and gluconeogenesis. This is a well known physiologic fact. Throughout most of the day, assuming you eat 3 meals a day, this is the normal state of affairs. But what happens when you go to sleep? Because you are not eating, you are fasting. Insulin levels fall. You now need to pull some of the food energy you’ve stored away to keep your vital organs running. This is the reason you do not die in your sleep every single night. As you fast, insulin levels fall. This is the signal to switch energy sources from food to stored food. You pull stored energy out from the liver (glycogen) and if that is not enough, body fat. Technically speaking, we say that we start glycogenolysis, gluconeogenesis and lipolysis when insulin levels fall. If you fast for 24 hours, for example, what happens is that your body wants 2000 calories for that day’s energy bill. Since you are carrying around plenty of body fat, it’s no problem to supply that 2000 calories. Approximately 1/2 pound of fat will supply that easily and the body says “Whoa, I have tons of fat, take all you want’. It is important to realize that this is a completely natural process. Humans have evolved this mechanism of food storage, and there is nothing inherently unhealthy about fasting. It’s all part of a natural balance of being in the fed state and the fasted state. Another way to put it is that this. You either burn fat or store it. You can’t do both at the same time. The body is just not that stupid. If food is plentiful, you store food energy. If food is scarce, you burn food energy (body fat). The key hormonal regulator here is insulin. The change in insulin levels is what signals our body to go into fat storing mode or fat burning mode. So what happens now if you are trying to lose weight by adopting conventional advice to reduce the dietary fat and calories, and eat 6 times a day. By doing so, you keep insulin levels high because you are eating lots of low fat bread, pasta and rice and eating all the time. This also happens in type 2 diabetes, where insulin resistance causes insulin levels to stay elevated. Since insulin is high, you must get your energy from food, and cannot get any from your body fat stores. You reduce your calorie intake from 2000 calories to 1500 and hope against hope that you will lose weight. You do, at first, but then your body must adjust. Since you cannot get at your fat stores, if you are only getting 1500 calories in, you must reduce you calorie expenditure to 1500 as well. So, you feel tired, hungry, cold because your body’s metabolism is starting to shut down. But the worst part? You don’t lose any more weight! Your weight loss starts to plateau, but you feel like crap. Over time, you start to regain some of that weight. So you decide that you’ve had enough and increase your caloric intake to 1700 – still lower than when you started. But, because you are taking in 1700 calories but only burning 1500 calories, your weight quickly goes back to what it was before you started the diet. Sound familiar to anybody? The key to successful long term weight loss is not reducing calories. It’s reducing insulin. Because insulin is the switch that decides whether your body is burning food energy or stored food energy (body fat). If you are burning food, then you are not burning fat. It’s as simple as that. The key to accessing your body fat stores is to reduce insulin. You must let your body go into the ‘fasted’ state. Eating lots of fat will not keep your insulin low, it will at most turn a short high spike into a long medium spike, which arguably might be even worse. You have to cut carbs to get into ketosis, but to then burn your body fat you also have to cut fats. Dont fall into the high-fat low protein trap, nobody there has any abs to show. Thank you. This is where I may have been going wrong should the protein be high then ? Don’t over complicate this…Eat meat! Please do not give advice about right and wrong diets. Everyone’s body is different. There are carbs and carbs. Fat and fat. Too much protein for some are can be hard on the kidneys. Myself as an example. If you eat a fat-rich meal, and hence produce little insulin, then you will presumably still utilise the digested dietary fat as a direct energy source. 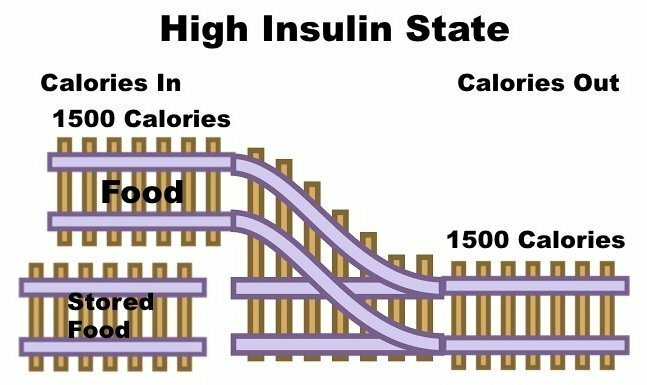 That’s the fed state but in the absence of insulin. So the key to successful long term weight loss is not reducing calories … it’s a combination of remaining in the fasted state for longer while also reducing insulin levels while int he fed state. Correct? This is what I also understand, very well said, thank you. 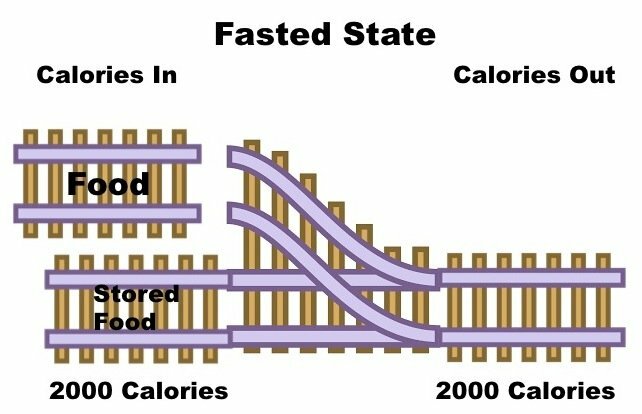 When you are in ketosis, cutting calories and lengthening the fasted state are the same. Not exactly. Even after eating a ketogenic diet for some time, when I ate at a large calorie deficit for a prolonged time, my weight loss tapered off and I had symptoms of metabolism falling. It’s what brought me to Dr Fung. I did experience keto assisted fasting by keeping my blood sugar more stable into the fast and helping me feel less hungry – my body didn’t have to keep making that painful switch in and out of ketosis. But cutting calories in keto like a regular diet doesn’t work well – at least, it didn’t for me. The other thing from this is, “If not hungry, don’t eat.” thus extending the fast and maximizing use or stored reserves. Eat by the stomach, not the clock. No where in the whole website does it mention how often should a person undertake fasting. Is it once a week? Is it 4 times a month? or Continue twice a week fasting till you hit the desired weight loss number?? I guess it be very beneficial if Dr.Fung could answer this. He wrote a book about fasting. He only reccommends long fasts (7-14 days) every 6 weeks I think. It could be longer, he recommends to be under medical supervision while attempting one of these longer fasts. You could simply do alternate day fasting. You eat every other day. There’s no set rules for fasting. Main thing is when you fast, fast. When you eat, eat! Don’t restrict calories on eating days, that could cause drop in metabolism. I believe Meagan Ramos meant that with OMAD you shouldn’t eat just 800 calories. Go the whole hog. Max out your daily need. Or get close to it. So Sasha says don’t eat high fat and you seem to be saying do eat high fat. I’m confused a bit. Is there an optimum or minimum/maximum fat that DrFung suggests. I’ve just started fasting and doing 22-24 hr fasts 4 days a week or so. Further, Dr Fung has a whole series of YouTube vids. There is a six part series that, pretty much, mirrors Obesity Code, if saving $12 is a consideration. I think it’s called “The Etiology of Obesity”…something like that. I should say that I try to fast every week, with exceptions around vacations and maybe every once in a while to take a break and keep my body guessing. There are no rules for fasting. I personally have a hard time during “reentry”. I basically have water in me, and it takes a while for me to settle down, usually a day or more for fasts of several days. So, I make sure longer fasts are not near days I travel. Others don’t seem to have this problem to the extent I do. Just a thought; is it possible to trick the body to burn stored fat by medically reducing insulin? Dr. Lustig mentions this in some of his lectures, in obese children that oversecrete insulin, drugs that reduce insulin do result in weight loss. The theory is seem to make sense, but the truth is that bodybuilders are eat all over the day, there is no fasting, but at their game time is very low body fat levels. Dr. Feng, how to explain it? Hi wang tao. Bodybuilders commonly consume more calories than they burn, as they are trying to increase muscle mass. In preparation for competition, during their “cutting phase,” they reduce their overall caloric intake – while still eating a high proportion of protein (the better to retain muscle tissue) – in order to lose body fat. Wang Tao, bodybuilders also consume a lot of human growth hormone and steroids that help them gain muscle and burn calories. All of those drugs are bad for their health. Can’t you still burn body fat while not in ketosis? Will your body take from both glycogen and body fat? There are people who cut calories and they do lose weight, though in the long term they may gain it back. So are they insulin sensitive? I like the fridge and freezer metaphor. And the coal-burning factory one. But I think of all the metaphors you’ve used to this point for explaining insulin’s role in switching between burning food in versus fat, this one is the clearest. I concluded the coal burning factory is a false equivalency. For it to be an accurate analogy a CRaP diet would never work. Clearly that is 100% wrong. The body’s “prime directive” is “do not die”. It will in the absence of carbs, burn fat. In the absence of fat it will convert protein to carbs and burn those carbs. What kind of Diet are you following though? That also plays a huge role…CRaP is usually paired with the wrong Foods as well (Carbs). The effect of eatin a High-Carb, Medium-Protein, Low-Fat diet is vastly different than Low-Carb, Medium-Protein, High-Fat. If you’re otherwise healthy, why don’t you just try it out and see if it works for you or not? I started IF at 65 ! Weighed 49 lbs less after 10 months,have maintained for last 18 months.Fit ans active but hardly athletic .It is my lifestyle and works for me ! Why do you keep saying this, like we’re supposed to take your comments to heart? Haha. You’re not the doctor, Walt. Stay in your lane. As a quick addendum. In both books he clearly states, “All diets work and all diets fail”. That includes fasting protocols as well as he does say on fasting, you will reach plateaus. Again, I encourage everyone who hasn’t read the books to read the books. You said it yourself – you should have lost 154 pounds, not 125. Obviously 125 is still terrific (Congratulations) but the point is you didn’t lose what you should have lost based on calories in and calories out. I think Fung would say because your metabolism slowed down. I replied to you above but can’t edit it to add… I don’t lose weight eating this way, either. I have to do 24+ hour fasts to see weight loss. I think it depends on how insulin sensitive you are. My insulin is a bit messed up. What really worked great for me was switching it up a lot, being irregular about length of fasts. This suits my personality & lifestyle anyway. Anything I do very regularly, my body will adjust to. Yep, I agree. They did not mention blood chemistry at all so they were just focusing on weight. I am new to IF and have struggled with understanding the concept, until now. Thank you for explaining it in simple terms that are easy to understand! One guestion. How would one increase his metabolism back to prior levels, assuming he has CR for a while and f.x. lowered his metabolism from 2000cal to 1500cal? Would fasting here help or hurt in the effort to increase metabolism back to prior levels? An essential question Svavar. I looked long and hard for the answer and just recently got it. Longer fasts, eat lots of fat. If you have lost weight, your resting metabolism will be lower. Even if you change your muscle/fat ratio, it will not make much difference. Smaller body = less calories. You have to get used to exercising more if you want raise your overall TEE. Thank you for you comments Walt and MikeT. There is something interesting that happened in this study. The women who didn’t complete their food logs and dropped out? When they followed up with these women later, there was NO difference in the high-low insulin groups. Only the women who kept their food logs the whole time had a different outcome! It makes me wonder if the fact of keeping a food log and being followed made some of those with high IR (bad eating habits) a bit more aware of what they were doing – so they saw the best outcome. I didn’t find that that there were any (biological) differences in weight changes between the three groups; in 18 months, gaining 1 kg or losing 0.5 kg is about the same to me, even weight fluctuations from day to day would explain them. What happens if I eat say 50-100 calories worth of carb in form of a biscuit or a bread while being on fast? Do I immediately go to burning carb but it won’t be enough for more than an hour so what happens after an hour because insulin will not immediately go down if I understand correctly ? would I suddenly start feeling tired after a while? It depends on the individual. 50-100 calories worth of carbs in a biscuit or a bread would make me feel exhausted and wanting a nap within an hour, make me hungry & obsessed with food and stop my bodyfat-burning for 2-3 days. But others would have no problem eating 12-25 g of junk carbs. Parth, the biscuit or bread ends your fast because it will generate an insulin response and turn off fat burning. It may well make you feel hungry when the insulin brings your blood-glucose back down. A good diet, even with moderate carb (adapted to the activity), with whole foods (and thus low on insulin response), is also effective at losing fat. Although ketosis/fasting is the “optimal” approach (I still find it a bit to extreme if you’re not obese or with a medical condition requiring it), it doesn’t mean it is the ONLY solution to lose fat. Technically it’s true. But emotionally this is not what we want to achieve. Right now, we don’t recognise and even ignore or despise the most powerful tool which is fasting followed by lowcarb/keto. We must talk about it and bend public attention. Of course you can loose weight on plant only diet – it’s low on insulin. But you see, the thing is the insulin response and we want to maximise it. It happens by doing fasting. Nobody denied other ways of loosing what, they are just not interesting for us. Why plant only diet ? Why Dr. Fung compares his approach to 6 meals a day of white bread ? As if there is nothing in between, healthy and with low insulin response, without having to go keto or extended fasts. When you fast you enter ketosis, which is the result of your body making ketones to fuel the brain from fat. How is it that I remain in ketosis, as measured by keto sticks, after having eaten low carbohydrate meal of salad, nuts, seeds and dressing? I think this suggests a special case of a dual track, doesn’t it? Thank you Walt. Sounds like we are from the same age group. How accurate is the Ketonix breath analyzer and what is it measuring? Thanks so much fun all of this information. ? Could somebody in Walt’s real life intervene and help him with the manic episode he is clearly having? Absolutely Jimmy, if you don’t have anything constructive to add, troll. So dignified, so adult. Kayleen, by “bad taste” is it maybe fruity or a little bit like nail polish remover? When in ketosis acetate is exhaled and that, depending on what you mean by bad taste, could be what you are sensing. Try mouth wash or brush your teeth more regularly to act like mouth wash. A week would be about the right amt of time. Perfect analogy & the visual–made it crystal clear. What’s the difference, doesn’t it still come down to calories in vs calories out? A slight calorie burn increase from not slowing metabolism is the only one I see. Well maybe when your fasting Calorie Reduction becomes Secondary or just a side effect of the Intermittent Fasting. I think it’s just a matter of semantics. So maybe Dr Fung is right in that CRaP will not work if you use it as the primary basis of your diet. Dr. Fung, please answer me this one question… If fat has virtually no effect on insulin and without an insulin spike there is no fat storage then in theory, I could ingest unlimited fat and lose body fat? Please explain this relations between low insulin calories and body fat reduction/increase. Thank you kindly for all you provide us. Speaking as a desperate post-menopausal woman who has been “dieting” for decades, and proving everything you’ve said, I just want to thank you for giving me this exciting lifestyle change. I have only been fasting for 2 weeks but I already see results and I am loving my 18/6 fasting routine. I have to disagree that we cannot access both. When I am eating low carb, I can lose weight. People who are on calorie-restricted diet can lose weight. That means that we can indeed Get our fuel from two sources at once.